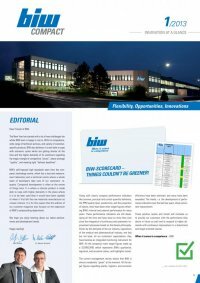 When it comes to competence When it comes to competence 1/2013 01 Compact When it comes to competence When it comes to competence INNOVATION AT A GLANCE BIW-SCORECARD – THINGS COULDN’T BE GREENER! Flexibility, Opportunities, Innovations EDITORIAL Dear Friends of BIW, The New Year has started with a lot of new challenges the whole BIW team is happy to rise to. With its competence, wide range of technical services, and variety of customer- specific products, BIW also believes it is well able to cope with economic cycles which are getting shorter all the time and the higher demands of its customers regarding the magic triangle of competitive “prices”, above-average “quality”, and meeting tight “delivery deadlines”. BIW’s self-imposed high standards stem from the com- pany’s technology centre, which has a test and measure- ment laboratory and a technical centre where a whole team of developers take care of our customers’ re- quests. Compound development is often at the centre of things here. It is where a silicone product is made able to cope with higher demands in the place where it is to be later used than it would have been capable of when it first left the raw materials manufacturer as a basic silicone. It is for this reason that this edition of our customer magazine also focuses on the expansion of BIW’s compounding department. We hope you enjoy learning about our latest achieve- ments and development trends. Happy reading! Ralf Stoffels Dr. Markus Wiethoff — Dr. Markus Wiethoff Along with classic company performance indicators like turnover, punctual and correct-quantity deliveries, the PPM quality level, productivity, and the proportion of rejects, there have been other target figures reflect- ing BIW’s internal and external performance for many years. These performance indicators are still devel- oping all the time and have done so more than ever since the integration of continuous and systematic im- provement processes based on the Kaizen philosophy. Driven by the demands of the car industry, regulations of the medical and pharmaceutical industry, and last but not least, all our customers’ expectations, they have become an integrated monitoring instrument for BIW. All the company’s main target figures make up a SCORECARD which represents BIW’s qualitative, logistical, and economic status, and highlights trends. The current management review shows that BIW is almost completely “green” at the moment. All the tar- get figures regarding quality, logistics, and economic efficiency have been achieved, and many have been exceeded. The trends, i.e. the development of perfor- mance indicators over the last few years, show consis- tent improvement. These positive results and trends will motivate us to provide our customers with the performance they desire in future as well and to respond to higher de- mands with continuous improvement in a determined and target-oriented manner. When it comes to competence – BIW.